Speedzilla Motorcycle Message Forums > Special interest > Project bikes > Drinking the V-4 Kool-Aid. Picked up my winter project for later this year. Always wanted one. Kid was moving tomorrow and needed money for school. It is rough!. Rough but complete with the little bits intact that are difficult to find today. Surprising was the OEM exhaust after all these years. It is very quiet. Brakes are terrible, but will be stripped down and rebuilt using braided lines anyway. The engine though started right up and ran smooth, shifted well, doesn't appear to leak a drop of oil. Encouraging. Back in 1985 they overbuilt things so much it is ridiculous. The passenger footpeg brackets probably weigh more than the entire rear subframe on my Mille. My wife's first reaction wasn't "wow what a POS" it was "that thing is BIG". If I had a nickel for every time I've heard...well never mind. It is 600 pounds, easy. And physically large. The original red seat (surely ripped) is under all that duct tape (this is the Ozarks you know, where duct tape is a legitimate fabrication tool). The contrasting white duct tape for the grab handle is perhaps my favorite feature that will be thrown in the trash in a few months. Updates about the time the leaves change!!! Crappy cell phone picks tonight, but had to get it in before thunderstorms. I always loved the Red White Blue paint on those things! I'm currently in the process of planning the project and collecting information and parts sources. 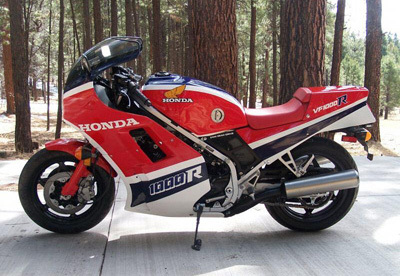 This bike is fairly rare (maybe 2000 sold in US) and is nearly 30 years old so parts are not overly plentiful. Ebay is a good source of used original parts, there are few options for upgrades. Therefore my plan is to return the bike as close to stock as is practical. Luckily it is fairly complete, only missing a few parts. It will never be a 100 point concours winner, but I could get it back to where unless you were a VF1000R wonk you would never know. However, these colors even if correctly mixed often will not match the colors on the decals exactly. Therefore a good plan is to get the decals in hand, then match the three colors to those displayed on the decals. Sort of working backwards from a color point of view. One of the first things I want to do is completely rebuild the forks and front brakes. Forks are currently painted black, correct color should be red. So need the red paint first before putting the forks back together. Complete disassembly and clean. New bushings, seals, dust wipers, repaint, 1.0 or 1.1 rate springs. Not going to do Gold Valve Emulators at this time unless the ride is really horrible, which seems unlikely when basically every moving part will be replaced. I will need to buy a 41mm seal driver. $26 on Ebay. upside is it will also work on the 851. Brakes at this moment are horrible, probably because the pads are coated in fork oil with both forks leaking. Rotors appear good, but will check them with a dial indicator for flatness. A good cleaning and wire brush to scuff them up a bit and they should be good. Good thing as rotors are NLA with zero alternatives it seems. The front wheel is filthy and has a touring tire mounted on it. Plan is to have the tire removed and replace the wheel bearings unless they look perfect. The finish on these wheels is pretty durable, so hopefully they clean up. These are multi-piece wheels that are difficult to disassemble. I have seen powdercoated wheels where the screws are just painted over: nasty. If they look bad after cleaning I will have to work on plan B. Many, many other things to do, this is just the front suspension. others will be discussed ad nauseum in later posts. In no particular order. Engine removal with cosmetic cleanup, full service. Frame is showing surface rust in a few places, hopefully it cleans up and the silver paint can be touched up, otherwise paint the frame. Crack open the gauges to fix or repalce broken needles. New mirrors if these do not polish out (OEM is NLA). 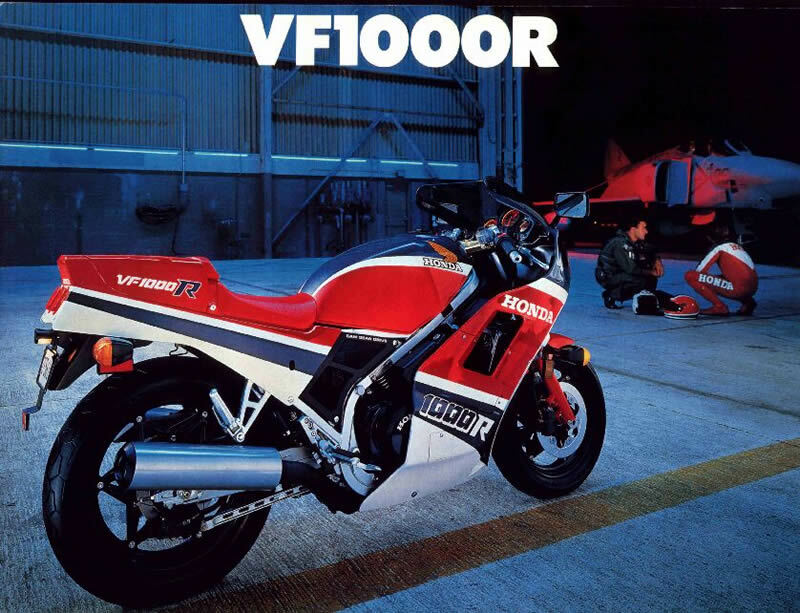 '86 VFR750 mirrors look good on these bikes. Several unique fasteners to hold the bodywork are missing, luckily many are still available from Honda used on other models. Leaning toward Hagon shock, longer than stock (to increase rear ride height) unless I can find a used Ohlins for a CBR600/900 and use Daughtery Motorsports for a conversion, then rebuild the shock to my specs. Stock exhaust on the bike is rusty, with probably have it powercoated or ceramic coated. Bodywork needs help many places. Full repaint. Will do the prep myself, may try painting too. Some sticky bias-ply tires. Few choices these days in the VF's old sizes. Last edited by sburns2421; 10-24-2013 at 02:51 PM. IF you're going to repaint it, go fo the Rothmans scheme. None to the US, but it looks awesome. You can change the wheels to be CBR600 wheels, with a little effort. Good luck. I had an 86, loved it, but it was too long for me. Lots of info over at VFRD. Well, the old girl is FINALLY being torn apart. Pulled the duct tape seat off and put a new battery in just to see what kind of electrical problems may exist. Covered in grime, probably hasn't had a bath since the reagan adminstration.